Former Defense Secretary Donald Rumsfeld appeared on Tuesday's Hannity and recounted the harm Newsweek did in 2005 with a false report about U.S. soldiers flushing a Koran down the toilet at Guantanamo Bay. Discussing the story with host Sean Hannity, he complained, "Later [Newsweek] said 'if part of our story wasn't correct, we apologize.' Of course, the people they were apologizing to were dead. Now, how does that happen?" 15 people died in rioting resulting from the article. Rumsfeld lamented, "Well, I suppose people want to be first instead of accurate and that's too bad." He added, "Of course, a lie races around the world 15 times before the truth even gets its boots on." Rumsfeld, who was promoting his new book, also appeared on Monday's World News, Nightline and Tuesday's Good Morning America. None of those ABC hosts questioned the ex-Defense Secretary about Newsweek's false story or the impact it had on America. Instead, GMA host George Stephanopoulos pushed Rumsfeld to apologize for not supporting a troop surge, ignoring the fact that many in the media mocked the idea of such an increase. On September 10, 2010, MSNBC's Richard Wolffe, who also writes for Newsweek, repeated the debunked claims. HANNITY: But, you did say this: You said "the irresponsible reporting of the media was harmful to our troops, as they were trying to build relationships with the Iraqi citizens." It wasn't just them, it was senators, surge failed, war is lost, they are killing innocent civilians in the dark of night. That was John Kerry on "Face The Nation." RUMSFELD: Yes, you know, the worst, one of the worst was the statement in the press that someone in Guantanamo had flushed the Koran down the toilet. HANNITY: You write about that. 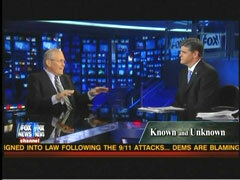 RUMSFELD: In the book I talk about that because there were riots in several cities and people were killed. Totally untrue, it never happened. RUMSFELD: Exactly. Later they said if part of our story wasn't correct, we apologize. Of course, the people they were apologizing to were dead. Now, how does that happen? Well, I suppose people want to be first instead of accurate and that's too bad. I've never been in that business so I can't be critical of them. I just don't know what I would do. I was hard to see those kinds of things said. Of course, a lie races around the world 15 times before the truth even gets its boots on. - Scott Whitlock is a news analyst for the Media Research Center. Click here to follow him on Twitter.